If you are thinking about getting a DNA test, you probably have a lot of questions. “Is it accurate?”, “Is it discreet and confidential?”, “How long does it take to get the results?” and “How much does it cost?”. At ANY LAB TEST NOW Loves Park, IL we’ve helped hundreds of men to answer the question: "Is this my child?" We’re confident we can help you. Even if you think the cost of a DNA test is out of your reach, give us a call. The affordability of a DNA test may surprise you. 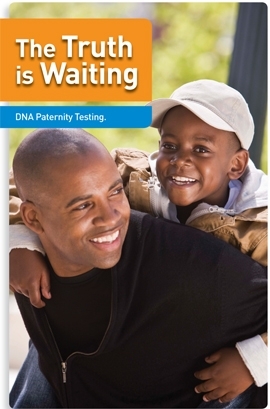 To get fast, free, no obligation information call (815) 397-8370 or setup an Appointment and let ANY LAB TEST NOW help you to answer with 99.99% accuracy if you are the biological father. DNA Tests from ANY LAB TEST NOW can help you establish paternity or a variety of other family relationships quickly, both for legal-admissibility and for your own personal information. With our DNA Paternity Tests, the results shows a probability of paternity with the father's participation that is 99.99% if he is the father, or 0% if he's not the father. Your child's future relies on knowing the truth and we're here to help. Test results are available in 3 to 5 business days and can be used in a court of law. The DNA tests are performed by professionals with NO additional collection fee. No Waiting, 15 Minutes In & Out. Our professional staff is expertly trained to perform DNA test collection and will do all the paperwork for you. We are happy to answer any questions you have, and if you make an appointment, we make sure you are in and out in just 15 minutes. 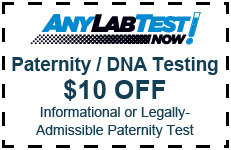 ANY LAB TEST NOW offers several affordable DNA tests including our Informational Paternity Test and Legally-Admissible Paternity Test that can tell you with 99.999% probability who the biological father of your child is. 2x Samples Tested, Every Time! Our AABB Accredited DNA Lab tests two DNA samples per person instead of one. We do this to compare the two samples, independently, so you know you're getting the most accurate results. Get it Done by Professionals! At ANY LAB TEST NOW, our DNA laboratories are accredited by leading institutions and each sample is tested twice to ensure the highest accuracy. Unlike at-home paternity tests, which can give you inaccurate results and cannot be used in court, our tests are legally admissible and 100% accurate. ANY LAB TEST NOW offers affordable, fast and convenient DNA tests performed by a certified professional with years of experience. When you call us, you will receive personalized, professional service. You will be assigned a representative who will assist you through the entire process from start to finish. You can make an Appointment for the same day and the whole process does not take more than 15 minutes. If you have any questions, you can call (815) 397-8370 and we'll be here for you. You should not have have any doubt after a DNA Paternity test. We stand behind our local DNA Testing service and we backup our guarantee of the highest level of accuracy. Our DNA paternity test offers the highest quality testing available in the industry. There are many ways to collect DNA. Don't see the test or answer you're looking for? Don't worry we can help you. ANY LAB TEST NOW offers a number of DNA tests to answer your specific questions. Call (815) 397-8370 and we will find the right solution for you! Call (815) 397-8370 for One Price With No Hidden Fees!